BC Comix & Games in Battle Creek, and Guild of Blades in Clawson. Check the schedule for a game near you. Welcome to the new website of PlayBattletech, your source for Battletech events in Michigan. 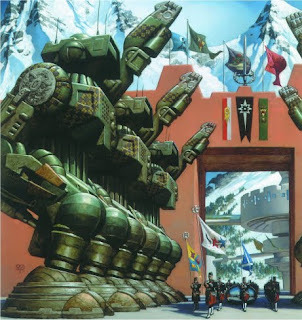 We've compiled for you a month-by-month listing of all the official (and some of the unofficial) Battletech events for the State of Michigan. This site also contains a list of Catalyst Games Agent firebases where you can find canon and special events. So check the schedule, find a game near you, and join the fight! If you'd like to join on monthly update e-mail list, please contact us at admin@playbattletech.org. Please note that your e-mail address will be kept confidential as we do not give our list out to anyone! Please take a moment and review the optional rules used in Battletech games run by Charles "IronSphinx" Wilson. 775 E. 14 Mile Rd. Stats for "the Dark Lady"
The Topps Company, Inc. has sole ownership of the names, logo, artwork, marks, photographs, sounds, audio, video and/or any proprietary material used in connection with Classic BattleTech. The Topps Company, Inc. has granted permission to PlayBattletech to use such names, logos, artwork, marks and/or any written materials for promotional and informational purposes on its website but does not endorse, and is not affiliated with, PlayBattletech in any official capacity whatsoever.